6.5 CPT points can be claimed after attending the full-day event. Forest Lin is Managing Partner of Tencent Investment and oversees Tencent's domestic and international equity investments. He has extensive experience in e-commerce, internet finance, O2O, media and content areas. Prior to joining Tencent in 2010, Lin held various senior positions in finance, strategy, and operations management at both Microsoft and Nokia. He holds a Bachelor of Engineering degree from Zhejiang University in Hangzhou, China, and an MBA from the Wharton School at the University of Pennsylvania. 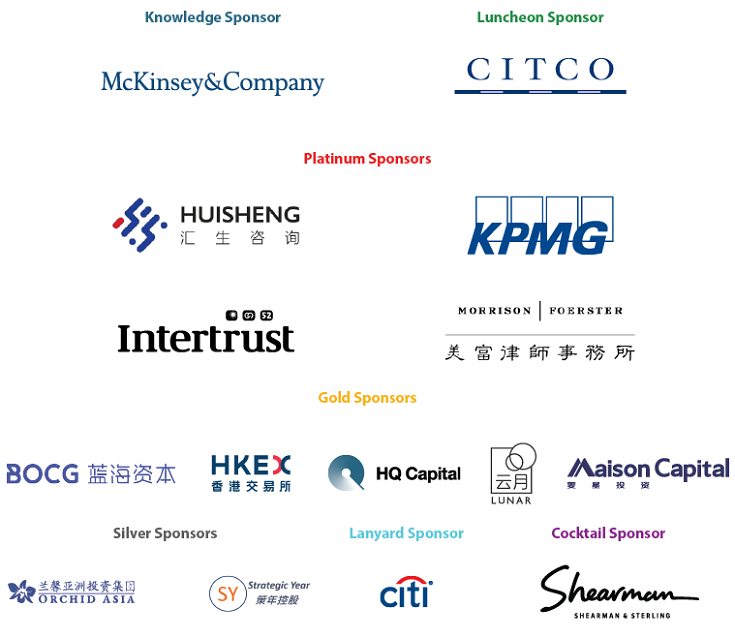 The China Private Equity Summit is an HKVCA flagship event, attracting over 550 venture capital and private equity practitioners, leading corporates, and other industry professionals and participants from across the region. It is recognized throughout the industry as the preeminent, “must-attend” practitioners’ conference, and features in-depth discussions and information on the latest developments and trends in the private equity market in China. 2017 was by any measure one of the most active years for new investments and exits in China’s PE/VC industry. We saw many PE/VC backed unicorns accessing both private and public markets to raise US$/RMB billions in funding, and the momentum is expected to continue. At the same time, M&A’s and control deals volumes are at record highs. At the macro level it is fair to say that we are witnessing the emergence of a new era in China. Concrete timetables have been set to achieve specific development goals: to build a “moderately prosperous society” by 2021, and to turn China into a “great modern socialist nation” by the middle of the century. The economy has been transitioning from “a phase of rapid growth” to “a stage of high-quality development”. Growth will be driven by technology and innovation, and will be more inclusive and sustainable. Against this backdrop, what is in store for the PE/VC industry in this new era? What sort of structural reform can we expect and how will these reforms impact investors’ entry and exit decisions? In what industry sectors should investors be deploying their capital? And, with new policies on regulating overseas investments, what opportunities and challenges are ahead for those engaged in cross-border deals? Simultaneous interpretation will be provided in English and Mandarin in the main conference room. The HKVCA web site may contain information that is created and maintained by a variety of sources both internal and external to HKVCA. The site may contain the personal opinions and other expressions of the persons who post the entries. HKVCA does not control, monitor or guarantee the information contained in links to other external web sites, and does not endorse any views expressed or products or services offered therein. In no event shall HKVCA be responsible or liable, directly or indirectly, for any damage or loss caused or alleged to be caused by or in connection with the use of or reliance on any such content, goods, or services available on or through any such site or resource. ©2018 HKVCA. All Rights Reserved.